All Players (Juniors/Seniors/Women/Masters) and Supporters are invited to our Club Night on Saturday December 16th. 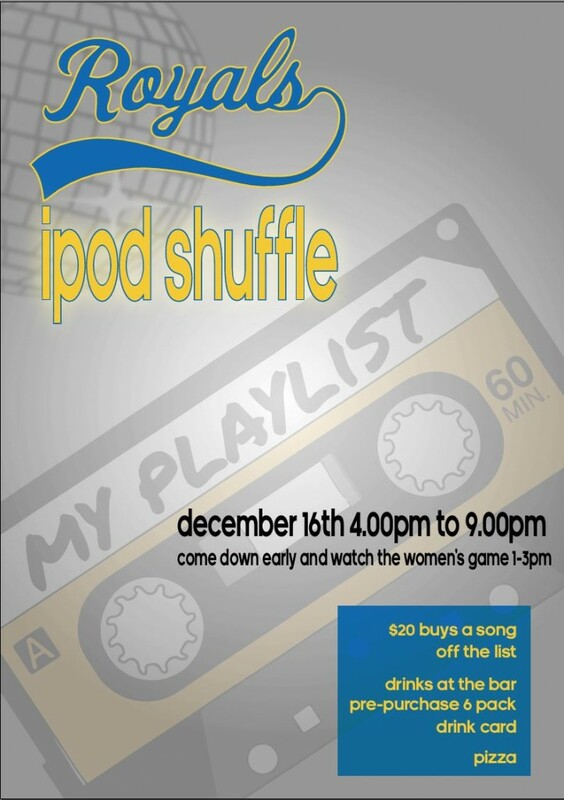 It will be iPOD Shuffle Night! The process is simple, $20 buys you a song. We then create a list of songs chosen. If your song is the last song played on the night, you get $200. Plus, spot prizes on the night. Pizza is provided, drinks at Bar Prices. Entry is $10 but free if you buy a song. You can buy as many songs as you like…the more you buy, the more chances to win. Songs are available to purchase from this Thursday at the canteen, or from Paul Rutgers or Tony. The fun starts at 4pm, but get there early and watch the Women’s team from 1-3pm as continue their great season with a home game against Doncaster. All players and supporters are welcome, we would request that Juniors are accompanied by an adult. We look to see you all then!